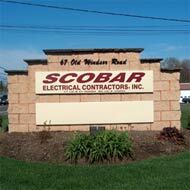 Scobar Electric Contractors, Inc's objective is to provide our customers with the highest quality electrical installation and service with the highest level of professionalism using dedicated, well-trained employees, while maintaining a profitable company that is an active benefit to our community. Are you looking for a new home in the neighborhood? Are you planning a new construction or remodeling project that's designed to enhance your interior living space?, or perhaps you've encountered, fire, water or storm damage, and need an affordable way to rebuild your residence. No matter what your situation is, you'll need the help of a qualified electrician. We'd like to be that help, because we're the best at what we do. No problem is too small . Because we understand that electrical problems could happen at any time of day, we have a 24-hour emergency service available for reliable and responsible work.